The L162550 Ottoman by Craftmaster at Home Collections Furniture in the Denver, Aurora, Parker, Highlands Ranch, Castle Rock, CO area. Product availability may vary. Contact us for the most current availability on this product. Frame Construction 5/4 hardwood rails; frames are 13/16 inch laminate hardwoods that have been double dowelled, glued and corner blocked for lasting stability. Seat Support Double tie wires on back and seat springs for additional support; heavily gauge sinuous wire seat and back springs for comfort; insulated clips to prevent spring noise. Warranty Craftmaster frames, are covered by a limited lifetime warranty. Cushions, springs, and sleeper mattresses are warranted against manufacturing defects for five years. 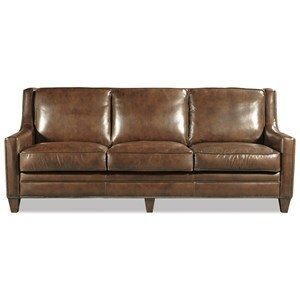 Leather sofas are so versatile, when they dress down they provide a casual, long-lasting seat for your hangout space. 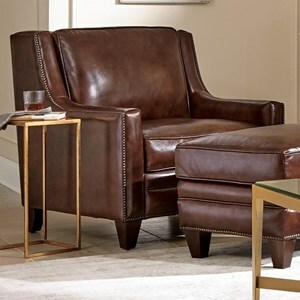 When they play to a more formal crowd, like entertaining the in-laws, leather sofas give your room a pinch of high end feel and touchably-soft texture. 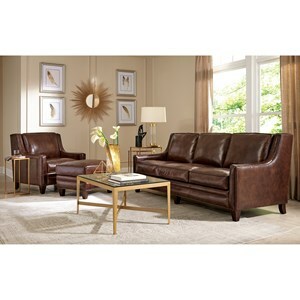 Here's a look that effortlessly makes the transition from dressy to casual - with strong, architectural lines, warm brown leather, and a border of side-by-side brass nailheads, this living room collection blends styles and brings rooms together. The L162550 collection is a great option if you are looking for furniture in the Denver, Aurora, Parker, Highlands Ranch, Castle Rock, CO area. 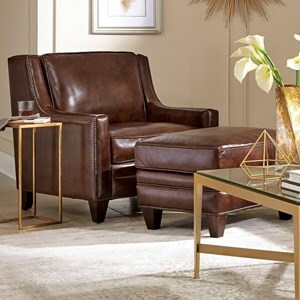 Browse other items in the L162550 collection from Home Collections Furniture in the Denver, Aurora, Parker, Highlands Ranch, Castle Rock, CO area.